The development of Strathbungo can be traced through historical maps. So here’s a quick tour – see what you can spot. Our first map, a part of the first detailed map of Scotland, is by Timothy Pont, and dates from approximately 1596. The counties of Renfrewshire and Lanarkshire are on separate maps. Strathbungo lay on the boundary, but is not mentioned here. On the Renfrew map, apart from Glasgow, there is Bridgend, which became the Gorbals, Polmady/Polmadie, Castletown/Castlemilk, Govan, Cunninghouse/Kinning Town, the newly built Hags Castle, home of the Maxwells, Pookshawes/Pollokshaws and Langsyd/Langside. The river Cart runs along the bottom. The Lanarkshire map is less clear, although Powmady/Polmadie is just visible. 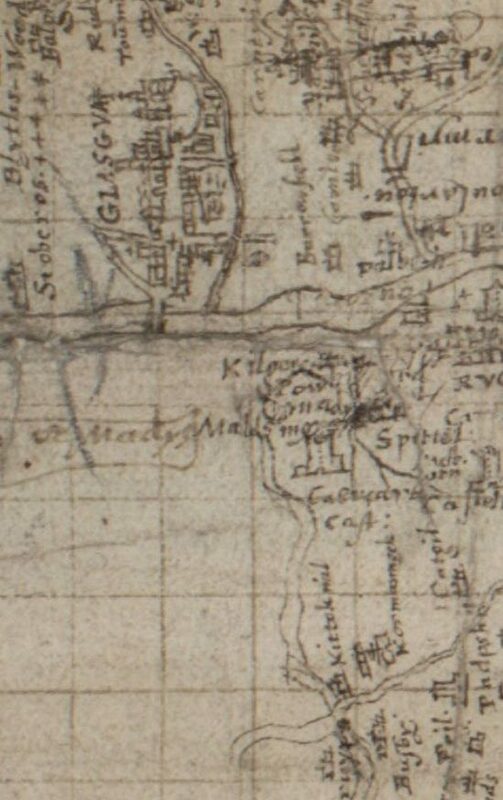 Robert Gordon’s mid 17th century map of the Barony of Renfrew includes similar names, and includes N Powok/Nether Pollok, the Maxwell estate. 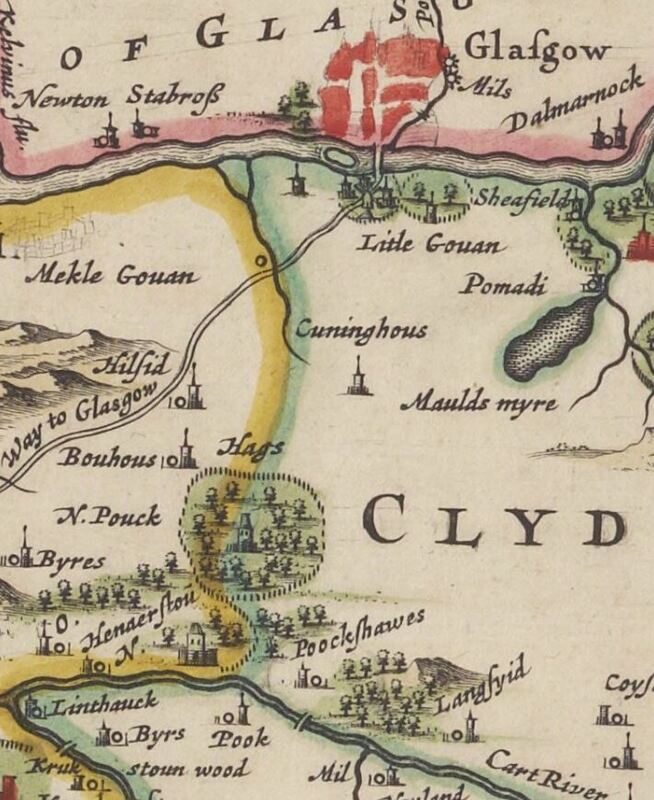 Joan Blaeu’s map of Clydesdale is turned on it’s side, North is to the right. 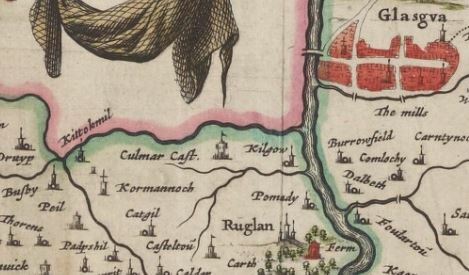 Kilgow and Culmar Cast are mysteries, although Kormannoch/Carmunnock and Kittokmil/Kittoch Mill near Carmunnock can be seen. On the Renfrew version, there is Little Govan/Gorbals, Cunninghous/Kinning Town, Pomadi/Polmadie, Hags Castle, N. Pouck/Nether Pollok, Poockshawes/Pollokshaws, and Langsyid/Langside. Note the names are similar to those on the Pont maps, on which these were based. Joan Blaeu’s Atlases were the first major atlases of the world, and the Scottish Atlas (1654), the fifth volume of his Atlas Novus, was a long time in the making, and based on Pont and Gordon’s works. John Adair’s map of the West of Scotland shows the river Cart, and includes Nether Pollok, Cathcart and Gorbals. Still no Strathbungo. Herman Moll’s maps of 1732 show little of interest to us, and are not included here. The Maxwells commissioned a map of their estate, prepared by Robert Ogilvy in 1741. 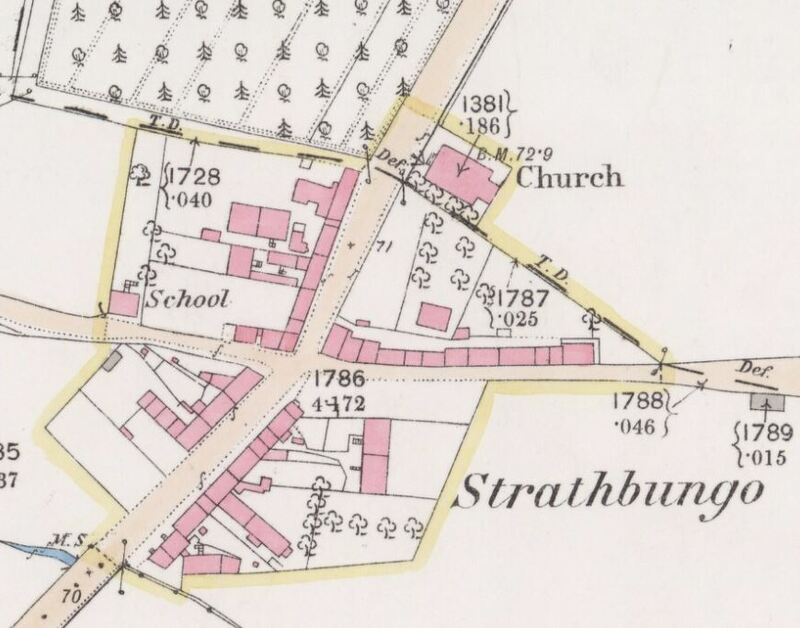 This is the first map to show Strathbungo, and it does so in considerable detail, although it is given the name Marchtoun, as preferred by the Maxwells. It shows a range of buildings along the west side of what is now Pollokshaws Road, and a number of crofts. The Spittal croft in the south east of the village suggests there may once have been a hospital or almshouse on the site. The map is analysed in more detail in Alexander Scott’s 1886 article on Strathbungo. However it was only a little over 10 years later when the name Strathbungo first appeared on a map, suggesting a conflict between what the Maxwells wished to call it, and what the locals preferred. 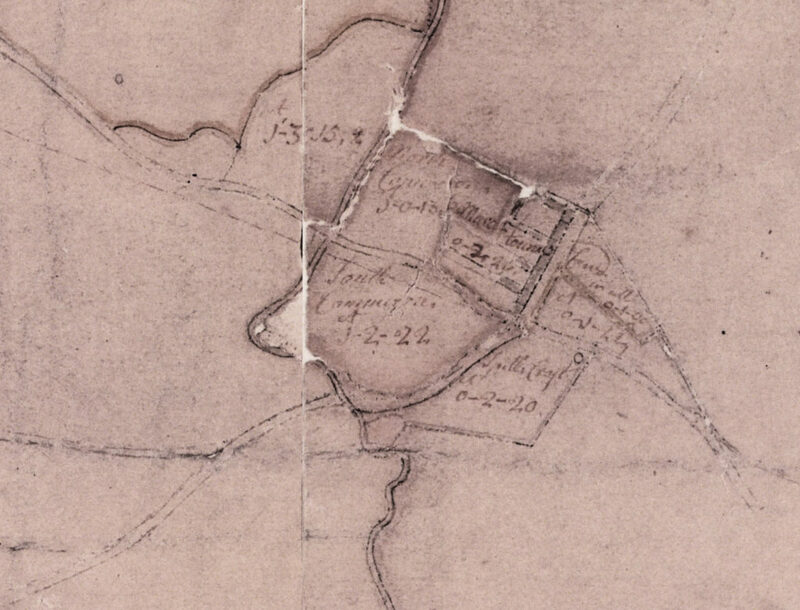 This sample is taken from William Roy’s Military Survey of Scotland, a government funded mapping exercise undertaken to better understand the geography of Scotland after the 1745 uprising was defeated at Culloden. It was the first ever detailed map of the entire country, and Roy’s pioneering work led to the formation of the Ordnance Survey the year after his death. 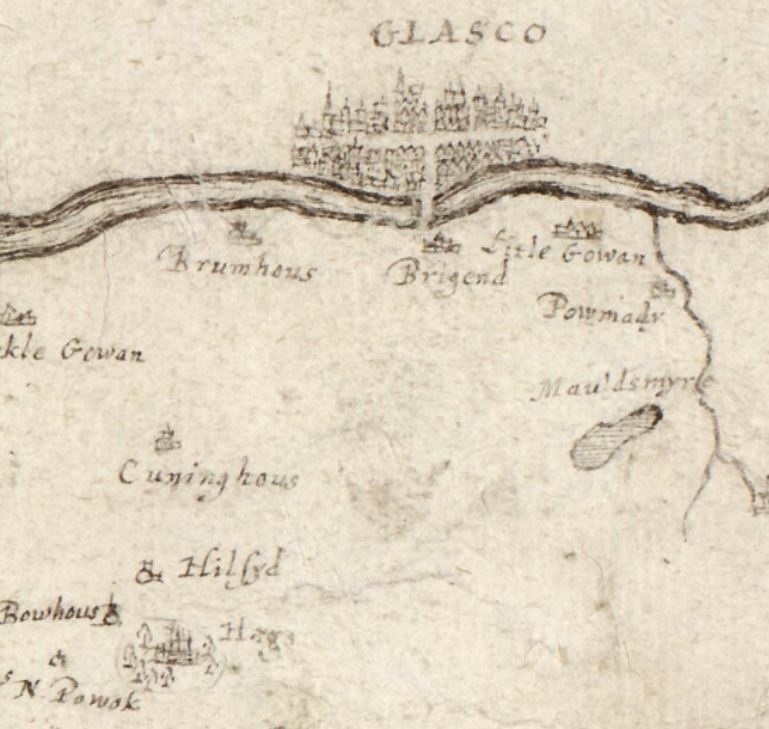 The area around Glasgow was surveyed in 1753-4. 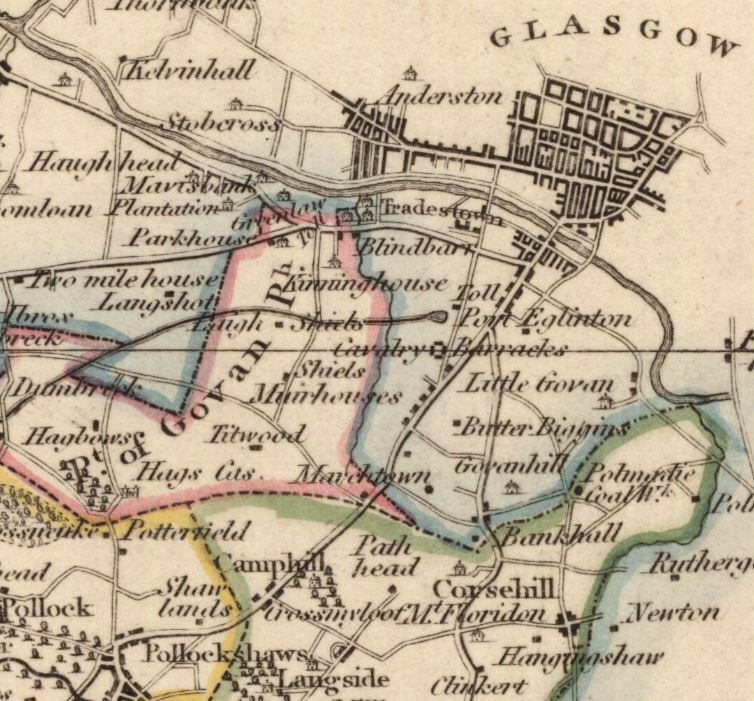 The map shows some houses at Strathbungo and Muirhouses on the road from Glasgow, and the farms of Titwood and Shields. 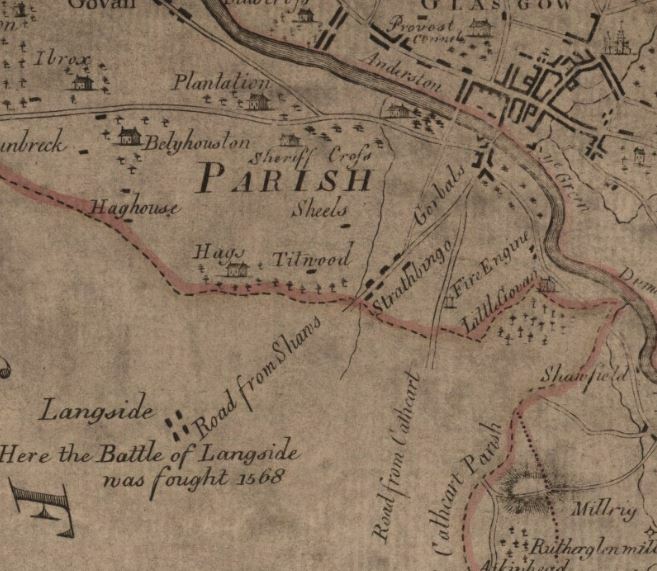 Charles Ross’ map of Lanarkshire is another map that includes Maxwell land in Lanarkshire, and puts Strathbungo in Lanarkshire too, although what is labelled as Strathbungo is actually Muirhouses further north (north of Albert Drive). 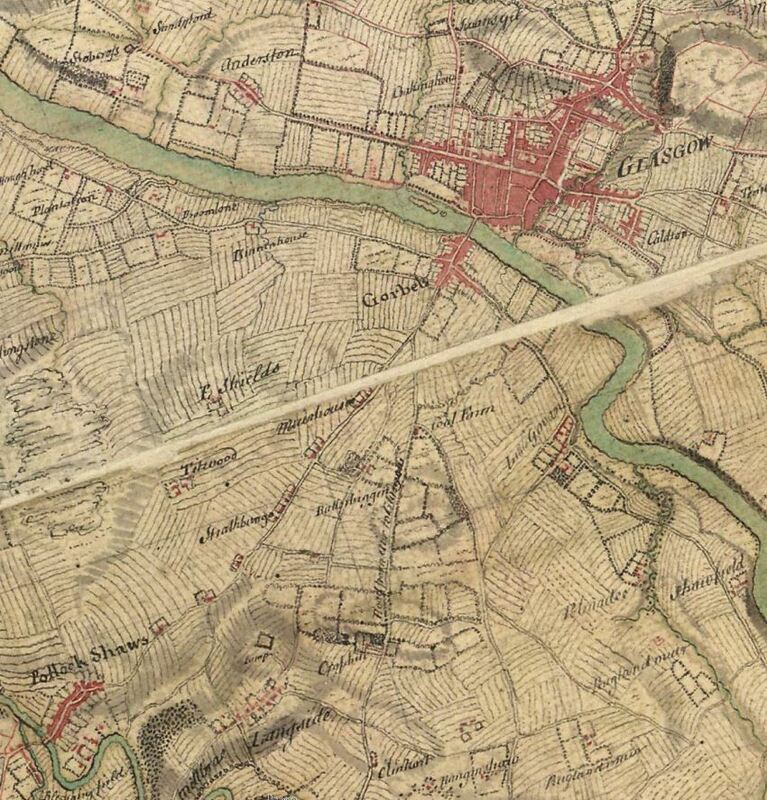 Taylor and Skinner compiled an atlas of strip maps of the major roads of Scotland in 1776. 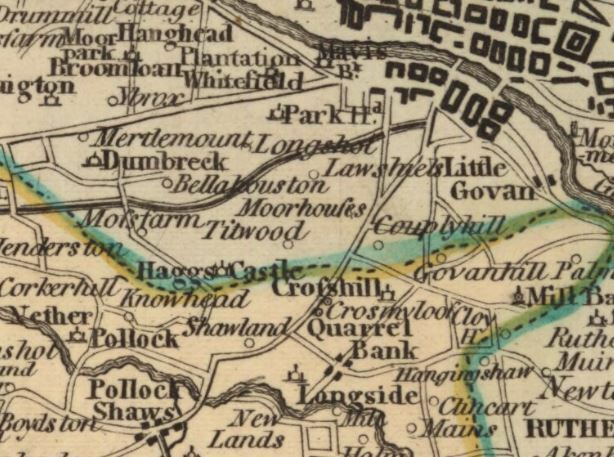 The road south from Glasgow ran through Strathbungo to Pollokshaws and hence to Irvine via Stewarton (now the B769). Strathbungo appears as Marchton on this map. 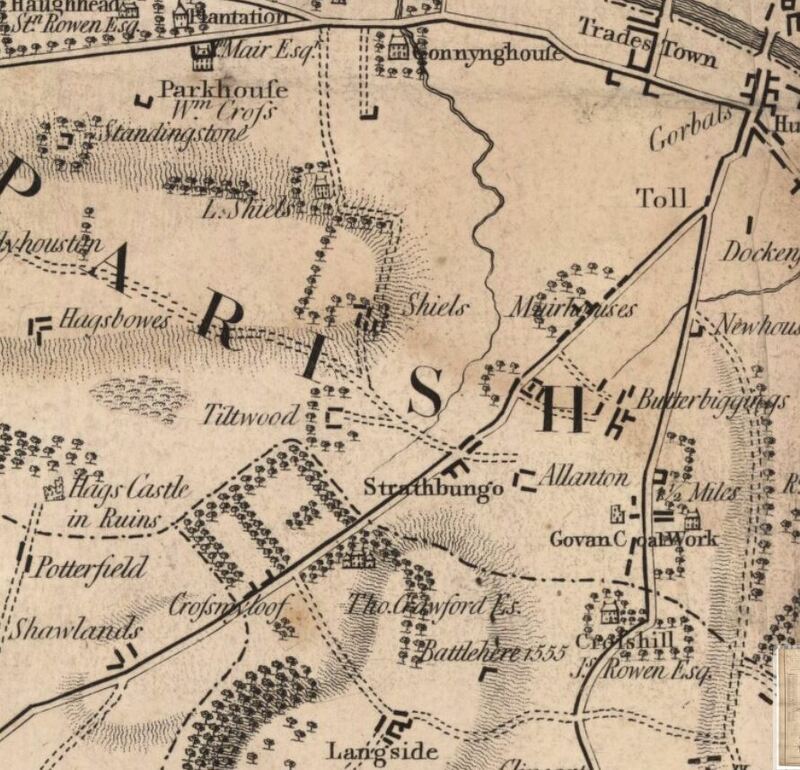 Thomas Richardson’s map shows the local roads in detail at the end of the 18th Century, as well as the course of the Kinninghouse or Shiels Burn that ran from Strathbungo to Connynghouse and the Clyde, and the Maxwell farms of Titwood and Shiels. Three more maps showing Strathbungo’s split personality. 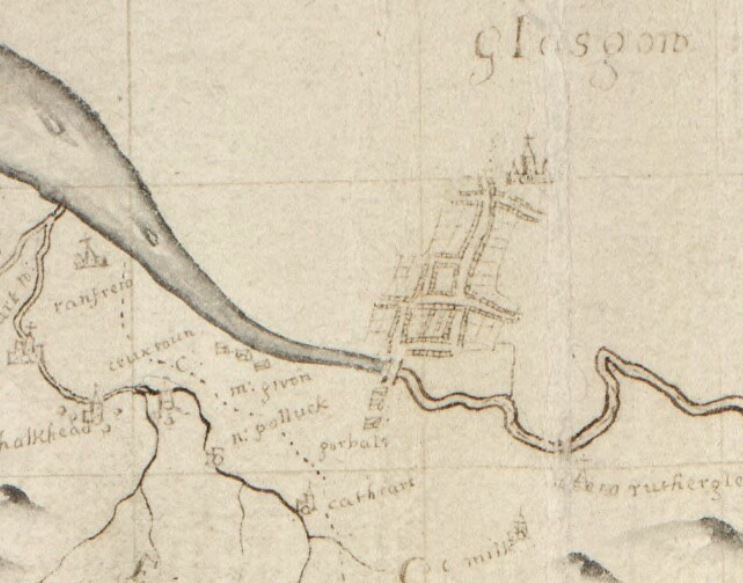 On Ainslie’s map of Southern Scotland it doesn’t appear, while on his map of Renfrew it is Marchtown. William Forrest’s map of Lanark includes it as Strathbungo. John Thomson’s beautifully detailed maps show the developing roads and villages, but before major urban expansion. They also show the parish and county boundaries. 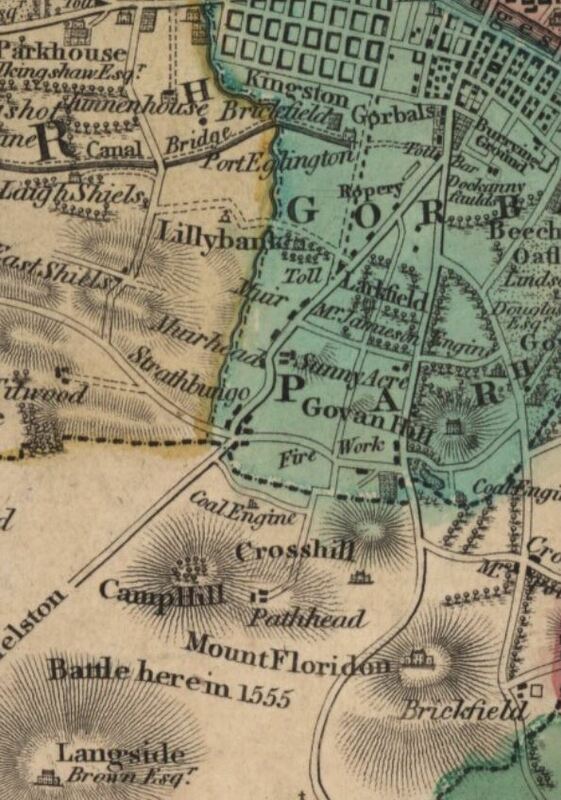 In his Renfrew map of 1826, Govan Parish is in blue, and in Lanarkshire, apart from The Maxwell lands, in red; they are still in Govan, but within Renfrewshire. Strathbungo is again named Marchtown, and is just within the south east corner of Govan Parish, bordering on Cathcart. 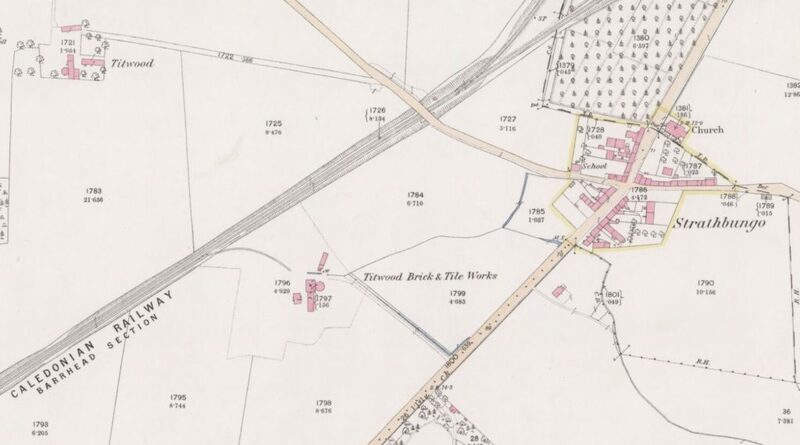 The minor road from Marchtown to Dumbreck, and the Maxwell’s farms at Titwood and Shiels, now Nithsdale Road, and its branch north to the river is now Shields Road. The Glasgow, Paisley and Ardrossan Canal can be seen crossing Shiels Road to its terminus at Port Eglinton basin. 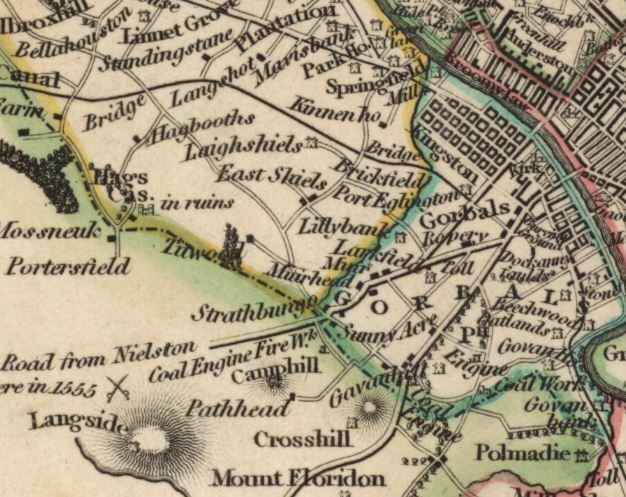 The canal was not a great success, since it never reached its intended destination of Ardrossan; it was filled in and converted to the Paisley Canal Rail line in 1881. Note also Pathhead Farm, now office buildings in the centre of Queens Park, and Neal Thomson’s Camphill House, also now within the park – the private accommodation by the 5-a-side football pitches. The Kinning House or Shiels Burn can be seen running from Marchtown to the Clyde, forming the boundary of Renfrewshire and Lanarkshire. 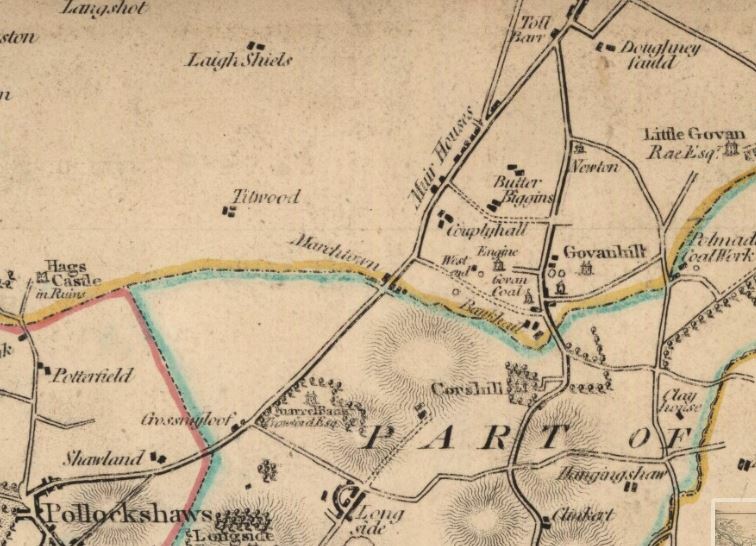 Note however on his 1822 map of Lanarkshire, the boundaries are all slightly different, and perhaps away from the influence of the Maxwells, the village is called Strathbungo, a recurring theme! Maps were expensive to produce, and relied on the patronage of the local landowners, which likely explains this – any cartographer of Renfrewshire wouldn’t want to upset the Maxwells. Finally we get to some detail. The first OS Map of Strathbungo dates from 1858, immediately before construction of the modern neighbourhood of Strathbungo began. The village is still on the crossraods between Pollokshaws Road and Nithsdale/Allison Streets. There is now a church, to save parishoners the long trek to Govan on a Sunday, although this was later replaced with the current building. The church is the only building in Lanarkshire. There is also a school. The Crosshill burn can be seen joining the Kinninghouse burn to the south wes tof the village, although these are starting to be covered over. A & T Hamilton’s Titwood Brick and Tile Works can be seen where the Marywood/Queens Square Lane now sits, and the Austin & McAslan nursery lies immediately to the north of the village. The new railway runs through Maxwell land but there is no station at Strathbungo. In the next section we will explore more modern maps covering the development of Strathbungo as we know it (in progress). 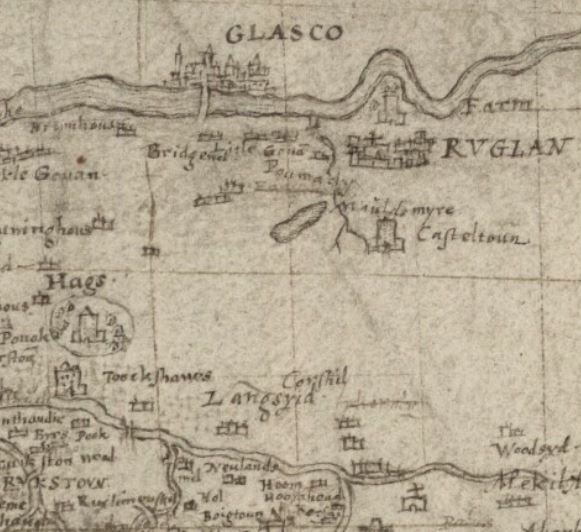 The maps on this page are reproduced with the permission of the National Library of Scotland. Their site includes a fascinating range of historical maps you can explore on line and is well worth a visit. The one exception is the Robert Ogilvy map, the original of which is in the Maxwell collection at the Mitchell Library in Glasgow.